Our local paper did a short interview with me last week (love the local paper, they really do support the community!) and the journo asked me why I wrote Facing Up. It’s odd but not many people have asked that, and I’ve never fully considered it myself, either! Basically the idea came when I was driving on the way to work over ten years ago. There was a moment on the wet road when the car wheels skidded, and it brought back the sharp memory of a couple of car accidents I’d been in many years prior to that, not long after first getting my licence. 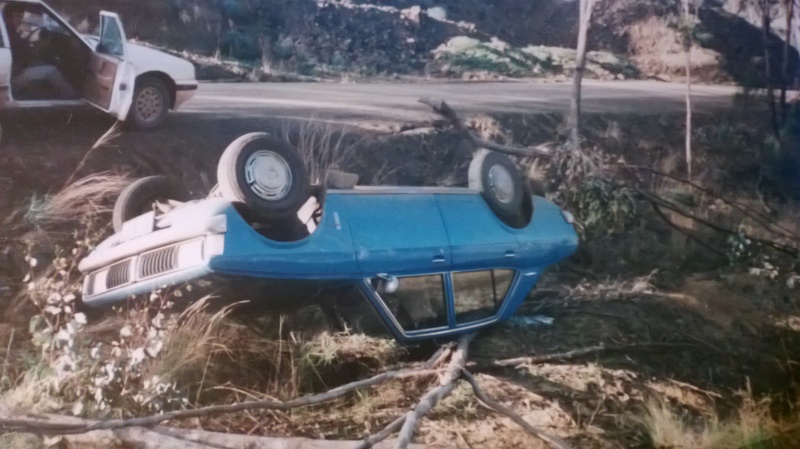 I was the driver in the first accident, when I managed to roll my car on an isolated country gravel road at night. I’m sure I wasn’t driving very fast, however I went round a sharp turn and my wheels slid on the gravel. The car did a 180 degree spin, and then the right-hand wheels went down into a ditch, enough to turn the car over. So it ended up on its roof, in the ditch, the wrong way round… In the dark, in the middle of nowhere, pre-mobile phones – it was definitely an experience I would rather not have repeated! That’s something else that will stick in my head – walking for miles in the cold night air down a gravel road in bare feet (my shoes having disappeared somewhere in the vehicle), hoping the nearest farmhouse wasn’t too far away, and supporting the miserable driver, who was in pain and understandably very upset. She had not been drinking but had been very tired, and was as inexperienced as myself on gravel roads. It took months afterwards to lose the sensation of the tyres sliding out of control, and I was told that I looked like a fearful little old lady driver around town, hunched nervously over the wheel and inching around corners. I was unbelievably lucky to escape with very little injury, apart from shock and a lot of bruises; but I ended with a healthy respect for gravel roads, and ‘driving according to the conditions’. I’m not sure why I didn’t write a book about car accidents on country roads, but it was fifteen years later on that damp road that Carly’s character popped into my head. A sullen teenager, wanting to learn to drive to regain some independence, but holding the memory of a horrific car accident in her head, feeling that sickness akin to motion sickness, of the tyres sliding away. Later, an author called JC Brennan wrote a YA novel called The Story of Tom Brennan, that covered the whole rural car accident/drink driving thing very well, so I’m glad I didn’t set mine in the country after all! This entry was posted in Young Adult book and tagged car accidents, driving, experiences, Idea behind book, promoting book, Publicity, teenager. Bookmark the permalink.